"Ready? I was born ready." 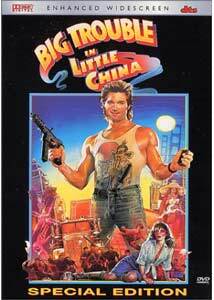 Jack Burton (Kurt Russell) and Wang Chi (Dennis Dun) pull into Chinatown in a big-rig truck and end up in the middle of a gang war. While they sit in amazement, the groups fire at each other with machine guns, then move forward and fight in a crazy hand-to-hand battle. Within a flash of supernatural light, the three Storms (Lightning, Thunder, and Rain) join the fray and basically kick everyone's behinds right off the street. If this wasn't enough, Burton and Chi drive right through a mystical seven-foot man while trying to escape the fight. There are definitely things going on here unexplainable within the realms of human logic. John Carpenter's Big Trouble in Little China takes us on a fantastical journey through the world beneath Chinatown of ancient legends, amazing skills, ridiculous creatures, and grotesque imagery. After a brief introduction, the story takes off and hardly takes a breath until its over-the-top conclusion. What keeps this film enjoyable is the tongue-in-cheek nature of its leading man and the sense of fun that invades the entire film. Without becoming too self-referential, the characters are entertaining and still exist within the confines of a central story. Even though the events depicted on the screen are ridiculous, Carpenter remains focused on a few basic ideas and doesn't lose them within the chaos. Upon its release in 1986, this film suffered due to its variance from the typical macho action film. Jack Burton was marketed as the next great hero, but this doesn't come close to the reality of the story. Burton actually is pretty inept, and much of the humor arises from his inability to act in the fashion of the perceived action hero. When a large group of enemies appears for the final battle, he shoots his gun into the ceiling and knocks himself unconscious. Earlier, Burton spends the entire fight bumbling around and trying to find his knife. The true action star is Wang Chi - an optimistic, martial arts expert who dispatches groups of enemies by himself. Burton displays the magnetic persona and build of a Stallone-like action hero, and he has courage, but lacks the smarts and coordination necessary to pull it off. The plot of Big Trouble in Little China concerns the aims of powerful demon David Lo Pan (James Hong) to find a girl with green eyes to escape a centuries-old curse. To achieve his goal, Lo Pan kidnaps Wang Chi's fiancée Miao Yin (Suzee Pai) and plans to sacrifice her. Burton and Chi join up to take down Lo Pan and rescue Miao Yin. Along for the ride are bus driver/sorcerer Egg Shen (Victor Wong), bright-eyed Gracie Law (Kim Cattrall), and journalist Margo (Kate Burton). Shen will stand against Lo Pan - his lifelong enemy - and knows a few magical tricks of his own. Law has eyes for Burton, but may also fall into Lo Pan's plan. The odds (and Burton's clumsiness) are against the group, but they must succeed to halt this evil plot. Standing in the way of the heroes are the Storms - the unstoppable Lightning (James Pax), hulkish Thunder (Carter Wong), and agile Rain (Peter Kwong). They rule the streets of Chinatown and appear virtually indestructible to any who oppose them. How can they be defeated? Will Jack Burton survive to see another day? Also lurking between the streets are a collection of oddball creatures, including the deadly Sewer Demon, the hairy Wild Man, and the ugly Guardian. Each one is unique and silly, and they produce more snickers than fear. Along with countless inept henchmen, they present only a minor threat to Shen, Chi, and Burton in their quest. Throughout his career, John Carpenter has excelled in creating unique visions that don't fall into a single genre or category. Starman was technically a science fiction picture, but it worked more because of its heart and comedic elements than the fact the main character was an alien. In the Mouth of Madness is technically a horror film, but it defies conventions with its pure ridiculous nature to be described so simply. Big Trouble in Little China covers numerous genres, including comedy, martial arts, Hong Kong action, and fantasy. In its simplest form, this film works because it provides an entertaining adventure into a new world. Carpenter took a chance that audiences would get into this crazy world, and it worked in the long run. Also, Kurt Russell is perfectly cast in the lead role, and makes this oafish, silly man a memorable and enjoyable character. It's a story for kids of all ages, with plenty of lively elements to keep audiences entertained throughout its running time. Image Transfer Review: Big Trouble in Little China features a nearly pristine 2.35:1 anamorphic widescreen transfer that rests on another strata from the past grainy video releases of the film. The crazy colors of the gaudy Asian costumes and monster set at the finale really shine through on this picture and look better than ever. This transfer is virtually free of defects or grain, and it only suffers slightly from the muted colors of the technology of the time period. Also, much of the story takes place within bleak, indoor settings, so the impressive colors aren't utilized as much as in outdoor scenes. Overall, however, this transfer delivers the goods and showcases the tremendous improvement to this movie brought about by the DVD format. Audio Transfer Review: John Carpenter's score totally springs from the 1980s, but it works perfectly to add to the cheesy nature of this story. This music reverberates wonderfully through the rousing 6.1-channel DTS audio transfer. While the gangs battle through the streets of Chinatown, the gun shots move nicely throughout this clear sound field with power and precision. Also, the magical effects of Lo Pan and the Storms (especially Lightning) crackle from the speakers and make for an exciting experience. This disc also includes a decent 4.1-channel Dolby Digital transfer that provides a nice sound presentation without the depth of the DTS track. It also has good movement throughout the sound field and plenty of force. An option of a Dolby Surround audio transfer is also available. Extras Review: Big Trouble in Little China includes a wide array of extra features over two discs that will occupy enthusiasts for many hours. The first disc contains an entertaining feature-length commentary by John Carpenter and Kurt Russell. A sense of enjoyment and fun permeates this entire track, and this correlates nicely with the nature of the film. Russell and Carpenter are friends and obviously have a lot of respect for each other, and this makes the commentary much more interesting. The conversation moves across a variety of topics, including other elements of their careers. Russell is extremely honest about his films and his future, and has a genuine enjoyment that can't be faked. Although this track fails to provide plenty of new information about the film, it does stand as one of the more entertaining commentaries on the market. The second disc is filled with supplements that cover numerous aspects of the production and marketing of this movie. First, it contains a group of eight deleted scenes that mostly are extended versions of actual scenes. Each scene contains a detailed description concerning its contents and why it was cut, and this makes this section more helpful. Overall, they provide additional background into the supporting characters, and many were cut due to pacing issues. While they're interesting, I can't fault Carpenter for any of these cuts. The lava sequence is notable because it allows viewers to see the storyboards for effects that were scrapped while viewing the filmed version. The final segment - "Six Demon Bag" - is a lengthy montage of outtakes and quick scenes that failed to make the completed film. A separate section contains an extended ending for the film, which offers an intriguing colder side to the Jack Burton character. However, it doesn't make any drastic changes to the plot of the story. A seven-minute promotional featurette covers the basic aspects of the film, but provides little information beyond the obvious material. This press pack is fairly useless, but it does give a little background into how the studio wanted to promote the film. Any shortcomings in this area are completely removed by the inclusion of two unique, in-depth magazine articles from American Cinematographer and Cinefex. These pieces vary from the usual DVD text pieces by also containing photographs from the story and several video scenes to complement the words. The first article spends a large amount of time focusing on director of photography Dean Cundey (Back to the Future, Escape From New York). It explores his work thoroughly and also looks at the sets and background of the movie. The other piece is a feature that is extremely lengthy and even has a chapter index. It concentrates on the special effects and makeup, and provides an amazing amount of behind-the-scenes information on their creation. Another exciting feature is a 13-minute interview with renowned special effects guru Richard Edlund (The Empire Strikes Back, Raiders of the Lost Ark) that took place more recently. While viewing a film like Big Trouble in Little China, it's easy to forget that it was made before the time of CGI effects. Edlund and his team utilized all the creativity that he could muster to build the strange creatures for Carpenter's vision. This interview features a montage of behind-the-scenes stills that runs alongside Edlund's commentary. A nice option exists of watching the shots on a full-screen with his words only in audio or of viewing his interview with the pictures in a small box. Edlund is a virtual encyclopedia of special effects knowledge, and he injects plenty of information within this brief running time. 20th Century Fox did an extremely poor job of marketing this film, and their problems are totally evident while viewing the extensive selection of trailers and TV spots. The theatrical trailers try to make Jack Burton an action hero, and they fail to project the energy and fun present in the actual movie. While they're lengthy and show a lot of action, the tone is awkward and they fail to do it justice. The six television spots are even worse, as almost all of them focus on Jack Burton and his silly, macho nature. They stress the hokey parts of the story, but miss the fantastical elements that make it exciting. Regardless of their merit, these previews do present a decent overview of the failed marketing push for this movie. The remaining supplements include a large stills gallery, cast and crew filmographies, and a silly music video. The gallery contains pictures of the cast, props, weapons, makeup, artwork, and much more and take a long time to peruse. The video features vocals from John Carpenter, and it obviously springs from the silly musical charm of the 1980s. Seeing Big Trouble in Little China as a ten-year-old kid was a memorable experience due to the fantastical elements that drew me into the story. Today, those items appear a bit outdated and silly, but the humor and energy still remain. Kurt Russell has never had more fun with a role, and the diverse supporting cast all jump into their quirky roles. With this new extensive two-disc release, this cult film deserves a place in anyone's DVD collection.